What would you say? Be honest. If I told you that was UF, AU or UT, would you believe that was a Top 10 team? What if I told you that was the #1 team in the country? The OL situation worries me. It's not a talent issue. We have talent coming out of our ears. It's just an experience question. It's true that a group with less depth and less overall physical ability lead Georgia to an 11 win season last year, but that group took some time to develop. It also had great senior leadership. I think this group will be pretty amazing later in the year. I just hope they can hang on and gel through the early games. Thank heavens for Stacey Searels. I'm not trying to be doom and gloom. The news on the isn't bad...it's just that 75 years of SEC history says OLs this young usually don't win titles. That said...you have to love this quote from Richt's media days (paraphrase b/c I saw it in the video, and I can't find it in anyone's article)...on Cordy Glenn. "He's got a big body, and when we run people at him..they don't seem to get very far. So yeah...he's going to play." Like last year, if you're gonna get Georgia you better get them early. thanks Paul, my rebuttal is a bit too long for here. yeah, i'm worried, too. i'm worried about the kind of play calling designed to keep the pressure down but which also contributed to the loss against sc last year. here's to hoping that they come together quickly. For some reason, I was a lot more worried last season. I think this crew is going to be pretty darn good, honestly, and Searels is great at coaching execution. I think we'll have some growing pains, but i don't see it being enough for us to drop any games early in the season. Here's the quote you were looking for. 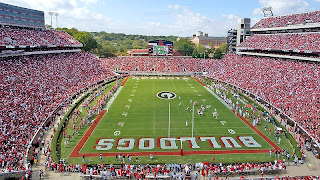 Thanks for keeping us all in the loop, as a bulldawg fan, I find your site invaluable. But if you added "and they went 10-2 last year with a boatload of similar O-line problems," I'd probably feel better about it. I have my concerns also. Lucid makes a good point, but there was some veteran leadership last year. I keep thinking, "next year, we are going to have an awesome O-line." Unfortunately, I don't know if we will have Stafford or Moreno or what the defense will look like.